It is time to cross another milestone off my list of accomplishments. Yesterday I ran and finished my first 5K race. Grab your favorite beverage and settle in for what may amount to be the longest post I’ve written to date. Saturday April 28, 2012 arrived so much sooner than I had expected but I was ready for the race. I was excited, as you know from my previous posts. I had already run the distance, so I was confident. I had a list of everything I had to do. I wrote a note with instructions surrounding my toddler Kaia’s schedule for Grandpa and Grandma. I had carefully packed everything I would need the night before. I even laid out my running clothes. I literally fell into bed with exhaustion at 10 pm but I was awake at 4 am and could not get back to sleep—I was that excited. It was much colder than I had anticipated so I donned my winter running jacket and wore a long-sleeved top. I had chosen to wear compression stockings and my running pants with the built-in skirt, so my legs were toasty. We left the house bright and early and I was nauseous for the entire 45-minute drive. Maybe it was all the nervous energy that made my breakfast seem like it was going to make a second appearance. 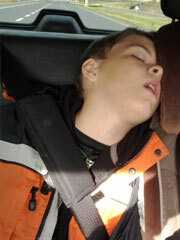 Tobias, my 11-year old boy, was sound asleep in the back of the Jeep. Bryan, my darling husband, was particularly chatty while enjoying a large cup of Tim Horton’s coffee. I was in tears for part of the ride. This was all pretty overwhelming for me and I couldn’t hold back the emotion. We arrived at Coronation Park in Oakville at about 8:30 am to find that the parking lot was full. We parked around the corner at a school where the event had arranged overflow parking. Then we headed off to find Mandi and Kristin who were going to run with us. The breeze off of Lake Ontario was cold and the ladies decided to sit in Mandi’s car for a bit while the March clan headed to the bathrooms. I have to say Coronation Park has some of the cleanest park bathrooms I’ve encountered. Then, we all headed over to the starting area to wait. Bryan seems to have coffee radar and next thing I knew he was enjoying another cup of coffee. We picked up our timing chips, strapped them to our ankles, and put on our race bibs. A little later everyone decided a bathroom break was in order but I was good, so I stayed near the start. I met up with Kelly, the race organizer, who snagged me and introduced me to the crowd. I know it doesn’t seem it, but I am incredibly shy about public events. I was glad my group was indisposed (smiles). I found the rest of the group and we chatted while trying to keep moving so we could stay warm. Bryan and Tobias had a plan to give it their all and strive for personal bests and I was so happy that they were going to do that. What a support team I have in my running family. Mandi took photos too. I really appreciated that my sweet friends Mandi and Kristin were going to run to the finish with me. By this time my hands were so cold that they were cramping. Note to self: keep a pair of mittens handy even if winter is over. The race was about to start. I was caught up in the excitement and totally forgot about the butterflies I had on the ride there. We got into our position at the start line, did some warm-up jumps, and the horn went off. I wanted to go but there was a lady with a dog in front of me so it was about 30 seconds before I actually got to the start line. When we made it out onto the road, I instinctively went to run on the sidewalk and Agnes had me come over to the asphalt. She mentioned that it is easier to run on the pavement rather than the concrete. Good advice (noted for future races). I ran… I tried to keep my pace steady although it is hard to tell when I don’t know the route and I don’t have a GPS. I chatted with Kristin. We ran and ran and then my right shoe lace came untied. Oops… I had meant to double-knot those suckers. The course loops and doubles back on the same road. The next thing I knew I saw the first runner on his way back. That man was as graceful as a gazelle. Seriously. For awhile Mandi and Agnes ran together while Kristin and I ran side-by-side. Every 10 or 11 minutes I’d walk for a little, just to get my heart rate down. As we rounded the corner about halfway through the race, Kristin was joking about Gelato (incidentally I’m having some after dinner tonight). We were closer to the water now and it was very scenic along this part. I was thinking about how sweet it was to have my friends as my pace bunnies. Then, as if on cue, there was a little bunny rabbit on the lawn of the building to our left. How strange is that? We kept running. I could see the end. Now Mandi was ahead of Kristin and I. I didn’t realize that she was actually taking photos. I walked for a moment or two. We decided to cross the finish line together and the four of us joined hands. I was on the verge of tears but I had a big smile plastered on my face too. I did it! I finally crossed a finish line! And in good time even. As we went over the finish line, I was so overcome with emotion that I hugged the lady trying to retrieve the timing chip from my ankle. She was probably thinking “what the hell is up with this crazy lady?” Too funny. Oh wait… let’s back up to approaching the finish line. I had shut my archaic mp3 player off a while back and I could hear one of the songs from my running playlist. That was weird. I was sure I shut it off. Then, as I got closer, I realized it was coming across the race sound system. The song was Soul Sister by Train. What is totally neat about this is that I am running another race in 28 days. 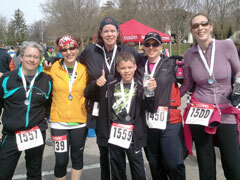 It is a 6-hour trail relay in the hills of Mansfield, Ontario, called the TREAD. I am part of a four person team and our team name is Sole Sisters. When we chose the name and had our shirts made, I also put the song by Train on my playlist as inspiration for training. How fitting that I finished this race with something that represents the next one. I believe that it was meant to inspire me. We got our finishing medals. I stretched, although today my body is telling me I should have stretched a little more. I drank some water; I checked my blood glucose and had some food. Then the awards presentation started. Once again I got called to the stage. Oh brother… my worst nightmare. Apparently I was the top fundraiser. Here we go again. Did I mention I really don’t like this sort of thing? Then I shook hands with a few people including Jacob. He is a boy about my son’s age who wrote a letter for the sponsor pamphlet about what it is like to live with Type 1 diabetes as a child who loves playing sports. Even though I am Type 2 diabetic and I was able to get off medications for the disease, I was on insulin at one time and I remember how tough it was dealing with four needles a day. It is constantly on your mind. I still have issues with lows and have to check my blood during runs but it isn’t as bad for me now that I don’t have to take insulin. Type 1 diabetics can’t stop taking insulin and to be a kid dealing with that… well it has to be hard. Jacob is an inspiring young man who represents just why this race was so important to me. It was an honor to shake his hand. 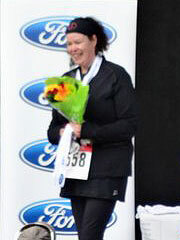 Then Amanda from the Juvenile Diabetes Research Foundation gave me flowers and gift cards for the Running Room. Kelly hugged me and gave me a special medal for my efforts. She also asked me if I had anything to say. I mentioned that Tobias helped raise some of the money and I thanked my biggest sponsor, Alexander Zoller. They gave me a special medal for Tobias as well. Now that you’ve heard all the details I am sure you want to know how I did with time. My original goal was to finish a 5K race and not have to be carried in a stretcher over the finish line. As my training progressed I wanted to finish that race in less than 50 minutes. Then that time went down to 49 minutes because one of my sponsors teased me that he wanted his money back if I didn’t run it under 49. Bryan finished with a time of 0:29:28.3 and was in 143rd place overall. Tobias, finished with a time of 0:27:12.0 and was 89th place overall. Not bad for a first race. Well, I exceeded my expectations. My final time was 0:44:13.0. I placed 292 out 314. I was 156 out of 172 in for my gender and I was last in my age group. And, I finished upright and smiling. When I come down from being so on-top-of-the-world about this one, I’ll have to make some plans for more races, revise my bucket list, and see what else I am capable of. So here I am. 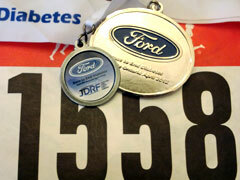 In two sleeps, as my 11-year old would say, I am running the Ford Race to End Diabetes in Oakville, Ontario. 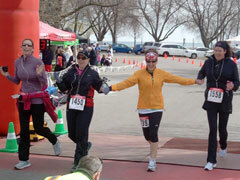 It is a 5K event starting and finishing in Coronation Park on the shores of Lake Ontario. When I started this running thing, back in November, I was sure I’d be in a much different place right now. If you had asked me then, I would have told you that I would be nervous, anxious, hesitant, and even scared out of my mind. I’m not feeling that sort of emotion, not even close to it. I don’t even have butterflies. confident, excited, exuberant, enthusiastic, buoyant, elated, ecstatic, cheerful, expectant, inspired, strong, tough, motivated, confident, sparkling, and even joyful. And… I am so ready to run this race! On race day I will be fierce and I will have fun! It doesn’t hurt my confidence that I’ve already run the distance a few times during my training sessions and that I have already achieved the pace that I first set out to get to. When I ran each of those 5K training runs it wasn’t on the treadmill but rather on the trail or at the track. It helps that other people have high expectations of me too. After all, my son and I were able to gather over $1500 in sponsorships for the Juvenile Diabetes Research Foundation. That’s a big deal for us, given that Diabetes affects more than one person in our family (myself included), as well as some of our friends. Two more sleeps and another milestone will be conquered. So, let the adventure begin… bring it on! I post this today because it is an important reflection of how I feel about the things I do when it comes to being diabetic. As you may or may not know, I’ve come far and I have reversed the need for insulin and oral medications to control my blood glucose. Recently, someone made a snide remark about how often I test and how much the time I spend on diabetes is taking away from my children. Her remark angered me. I found it narrow-minded and completely off-base. This letter to my children is my response to the lady’s very insular comments. I want you to know that you are much wanted and loved beyond words. I try to show you this every day but sometimes it may not seem like it. Those times when Mommy is taking a blood glucose reading or going to an appointment or running on the treadmill may make it seem like I am too busy for you. It may seem selfish. It’s not. I do these things because of my love for you both. You are the most important people in my world and taking great care of my diabetes is something I do for you as well as for myself. I want to be here to see you grow up by being as vibrant and alive as I can be. I don’t want to lose any more eyesight than I already have. I want to be able to run and play with you and have fun. I don’t want to lose my quality of life or my mobility. I also want you to learn the importance of being active, eating healthy and doing it as a family. I want to make sure that you never get this disease but that if you do, you’ll know you can handle it—diabetes does not have to hold you back. So when I have to tell you that I’ll look at something a little later because I am poking my finger, remember that it is important and that I do it out of love for you. Know that running and other exercise is my medicine. Giving up this little bit of time now means we will have more time together overall. It means that I will be here when you need me. Your smiles and hugs and kisses give me strength. They illuminate my heart like a thousand fireflies lighting up the night. Your love reminds me why I stay the course, no matter how difficult it can be. I woke up this morning with a full-fledged cold. I’m whiney and I want my Mom and a hot cup of tea and a good book and a nap. 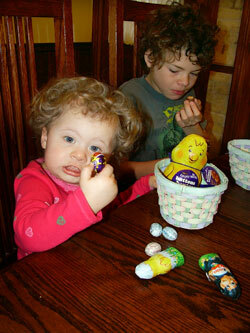 As the Rolling Stones sing, “You can’t always get what you want…” I’m a Mom, first and foremost. We all know that, as a Mom, my responsibilities just can’t be shelved for a day while I wallow about feeling unwell. I have to do what needs done for the children. This lifestyle journey of mine is another way that I do everything I can for my children. Being healthy, active, and happy is akin to when I put my little ones before being a sucky baby with a cold. There are times when I don’t want to workout but while I may not feel up to it but I have to commit to it for my children and for myself. 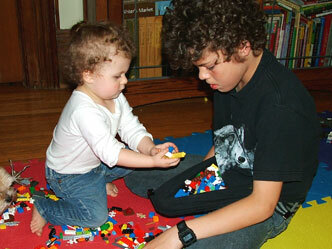 To give it my best effort sets a shining example for Tobias and Kaia. It lengthens my life and makes me happy. Being happy means I can give more to them emotionally too. Speaking of lifestyle, health, and happiness, I figured I’d step on the scale this morning to see where I am at. I know, I know, I said I was going to avoid the scale but I could not resist. Remember? I am obsessed. I’ve felt my body changing and that was most evident when I bought the dress last Saturday. It wasn’t just about the size on the tag, which actually was a bit of a pleasant shock to me, but it was how it looked on me and how it made me feel on Monday when I put it on to show my girl friend. I decided that perhaps I should just take a little peek at my weight and I even justified it with wanting to update my weight in DailyMile so that value for calories burned in each workout has some accuracy. The result? You expected a number didn’t you? Let’s just put it this way… I am at the smallest I’ve been, from a height-weight perspective, since just before my 14th birthday. That’s a mere 29 years ago. I am proud but more importantly, I am happy about the message that leading a healthy lifestyle is sending to my children. And… I have 27 pounds to go before I am no longer considered overweight by medical standards. Of course, that number is a BMI calculation and muscle vs. fat ratio will play a definite role in the final outcome but it gives me an idea of how little I have left to lose. I couldn’t be more proud of myself. I have come from being in the category of Class III obesity with a BMI of around 53 to being in the overweight category with a BMI of 27.2. One word comes to mind… Awesomeness! I have a playlist that I currently enjoy running to. I have it perfectly timed so I know when to do my intervals. Every song has a reason for being there or an inspiration behind it. Take Soul Sister for example, that’s our team name for the Chico TREAD 6-hour relay in Mansfield this May. This is Our Fight by The Ten Daze is there because of the words and because professional trainer, Dolvett Quince of Biggest Loser fame, overcame his fears and surfed for the first time. This was the background song for the final cut. But I have a problem. You see, at home I get all goofy and sing while I run. At the end of I Like to Move It the artist says “You think this is never going to end, but it is. 3 – 2 – 1. Not bad, eh?” and I answer. When Waka Waka comes on I even do the odd hand motion from the music video. Not great running form but I just can’t help myself. Music makes me want to dance. I raise my hands and cheer when I am finished the run and start my cool down. On Sunday I was running 5K on the track at the Wayne Gretzky Sports Centre here in the city. I was with my husband, the kids and three very supportive friends and the track was fairly really busy—there was a hockey tournament on as well. That meant loads of people within earshot and if you have ever heard me sing, you have my sympathies plus I owe you a pair of ear plugs. Now you understand why I had to really stop myself from doing this on the track lest I embarrass myself… or my companions. It wasn’t just once or twice either. I found that I was catching myself on the verge of an off-tune bellow each time I did a lap. Then I saw the proud Dad taking video of his son’s hockey game. Could you imagine having my voice in the audio track for the few moments that I ran by? Too funny. At least I maintained control while my friends and family were spared from my horrible attempts at singing… this time. I can’t guarantee that it won’t happen at some point though…. lol.